At that time, Peter was sitting in the yard. A servant girl came to Peter. The girl said, "You were with Jesus, that man from Galilee." But Peter said that he was never with Jesus. He said this to all the people there. Peter said, "I don't know what you are talking about." Then Peter left the yard. At the gate, another girl saw him. The girl said to the people there, "This man was with Jesus of Nazareth." Again, Peter said that he was never with Jesus. Peter said, "I promise to God that I don't know this man Jesus!" A short time later, some people standing there went to Peter and said, "We know you are one of those men that followed Jesus. We know this because of the way you talk." Then Peter began to curse. He said strongly, "I promise to God that I don't know this man Jesus!" After Peter said this, a rooster crowed. Then Peter remembered what Jesus had told him: "Before the rooster crows, you will say three times that you don't know me." Then Peter went outside and cried bitterly. Confessing Jesus and praising him loudly and boldly is very easy among friends and fellow believers. But what will we do when our perception of Jesus' power and love are rattled and we find all of our dreams shattered like broken shards of glass lying at our feet? Will we confess him as Lord then? Will we serve him because we believe and because he is Lord even when there is no external or readily apparent reason to serve him? Peter's rooster has crowed in many lives since Peter heard it and realized what he had done: broken his word to the Lord and broken the Lord's heart. 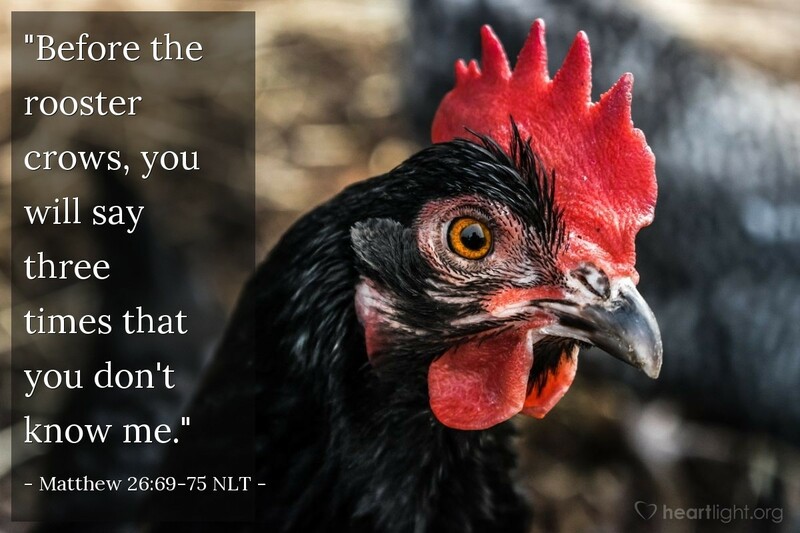 That rooster crow comes in many forms, but it is that agonizing moment when we personally realize that we have betrayed or denied our Lord—not for thirty pieces of silver like Judas and not for fear of our life like Peter, but for nothing. The really powerful and beautiful part of this story is that unlike Judas' betrayal, Peter's story doesn't finish here. He returns to serve and glorify the Lord in mighty ways. So for those of us who have failed mightily, there is not only hope, but a proven example that Jesus welcomes back failures to make them strong and call them to his service. In the meantime, let's keep trying to be strong and not fail with the help of the Lord's Spirit and the confidence that Peter would not know until Jesus had risen from the dead! Almighty and holy God, I fully recognize that I make promises that I cannot keep. Please forgive me when I have been rash with my promises, slow in keeping my vows to you, and weak in fulfilling my commitments. There is a bit of both Peter and Judas in me. This troubles me and shames me, but also reminds me that I need your strength and your Spirit to be strong and to live faithfully. My truest prayer, dear Father, is that I never outlive nor betray my love for you and the grace you have given me in my Savior. In the precious name of Jesus I pray. Amen.